Spotlight: Paul Reha Butros, M.D. 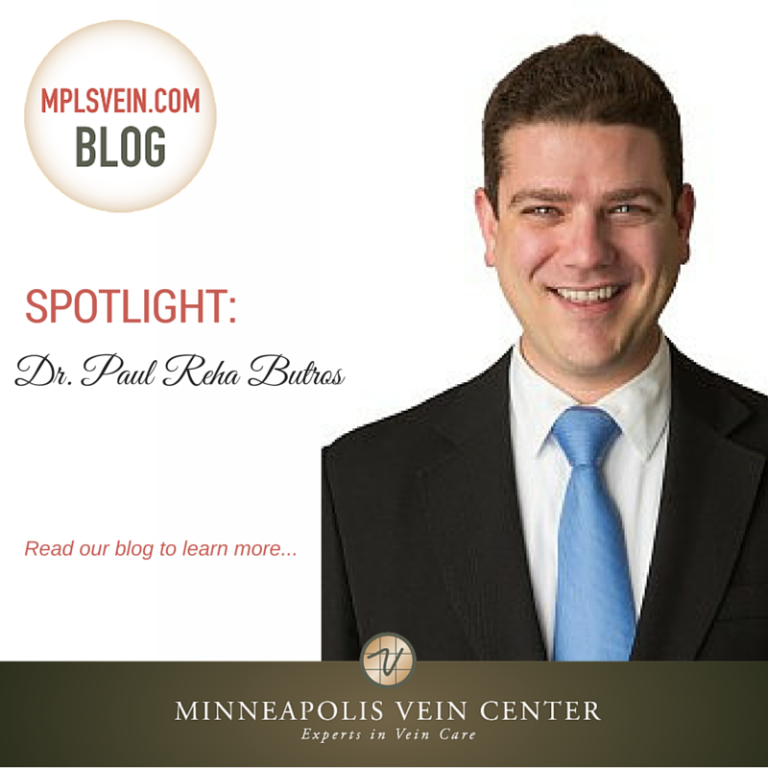 Minneapolis Vein Center Blog Spotlight: Paul Reha Butros, M.D. Dr. Butros has been working with Minneapolis Vein Center since July 2015. He is an experienced interventional radiology physician with fellowships in Interventional Radiology from Harvard Medical School in Boston, MA, and Miami Cardiac and Vascular Institute in Miami, FL. We’re shining the spotlight on Dr. Butros this month and he’s giving the answers you want to know. What is the biggest misconception about venous insufficiency? Many people don’t know about venous insufficiency and often attribute its symptoms to some other condition. This is especially common in older patients, who think leg pain and swelling is just a normal part of aging, but it also happens in many younger patients, too. Venous insufficiency affects up to 30% of the population, which makes it quite common—and it is certainly treatable. If you have these symptoms, it’s important to talk to your doctor to see if there is a treatment available for you. What led you to the field of interventional radiology? During medical school, I was fascinated with the field of Interventional Radiology because it was at the forefront of technology. Interventional radiologists were using all high-end, advanced tools with imaging guidance to navigate through vessels in a minimally invasive fashion. They were able to deliver high quality care with a relatively low rate of complications. It was the most innovative field in medicine and I knew I wanted to be a part of that. What do you enjoy most about treating patients at Minneapolis Vein Center? The most gratifying part of being a physician is to see that I have benefited my patient, and improved his or her quality of life. When a patient says, “thank you doctor, I feel so much better,” that makes my day and I go home happy and satisfied, knowing that I helped someone. If you could give just one piece of health advice to all men and women, what would it be? I think the best advice is to do everything in moderation. Know that a good steak or a couple drinks every now and then won’t have a dramatic effect on your health. But do your best to maintain good hydration, regular exercise and sleep, a well balanced diet that includes lots of greens and avoid smoking to stay as healthy as possible. I most enjoy spending time with my wife and two year-old son, and our dog, Einstein. We are new to the area so we are still exploring all of the parks, trails, and restaurants that the Twin Cities has to offer.